The Chicago Public Schools and the Chicago Teachers Union seem to be engaged in a game of “chicken,” where the both sides continue to decelerate before collision. CPS CEO Forrest Claypool on Friday backed off of a threat that the district would immediately end the teacher pension pickup and force teachers to pay their full 9-percent pension contributions. Claypool says he believes CPS is on solid legal ground to end the pickup anytime, but says he wants to wait until after an independent arbiter completes a fact-finding mission on April 18 as part of stalled contract negotiations. Lewis would not specify what exactly that meant and whether or not it would result in the cancellation of classes. The two warring sides also clashed on the move toward an elected Chicago School Board. Yesterday, the Illinois General Assembly overwhelmingly passed a bill that would replace the mayor's appointed school board with 21 elected members. 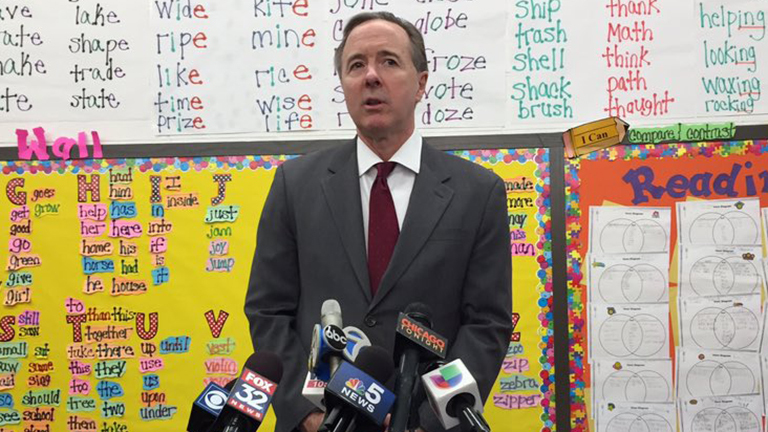 “The answer to CPS' fiscal problems is not to have 21 politicians running the schools,” Claypool said. The bill moves to the Senate, where Senate President John Cullerton, a close Emanuel ally, has indicated he would not call it for a vote. Lewis today also acknowledged that her membership would not be able to strike over CPS' recent call for three unpaid furlough days for teachers. One of the days is the Christian holiday of Good Friday, when thousands of teachers have already requested the day off. He says the furloughs will save the district $30 million, while Lewis says it amounts to a 1.8-percent pay cut. March 2: Three Chicago charter schools are celebrating a victory today: a state commission has ruled they will be able to remain open, despite Chicago Public Schools' plans to close them for poor performance.